PALMDALE, Calif. – March 12, 2012 – Norwegian State Secretary for the Ministry of Defence Roger Ingebrigsten met with Northrop Grumman Corporation (NYSE:NOC) executives Feb. 29 in Palmdale, Calif., where Northrop Grumman produces the F-35 Joint Strike Fighter center fuselage. As part of his visit to the United States for an update on the F-35 program, Ingebrigsten was accompanied by members of the Norwegian Ministry of Defence, Norwegian air force, Kongsberg Defence & Aerospace and the Norwegian media. The group also visited Edwards Air Force Base, Calif., for a flight test demonstration. The Norwegian contingent received a program update from Randy Secor, deputy of the F-35 program for Northrop Grumman, who complimented the technical capabilities of Kongsberg and the quality of the composite parts they supply for the center fuselage. In addition, the Norwegian officials toured the Integrated Assembly Line (IAL), which plays a major role in producing the center fuselage. The IAL maximizes robotics and automation, providing additional capacity and assembly capability while meeting engineering tolerances not easily achieved manually. The IAL is one of the ways Northrop Grumman increases the program's affordability by reducing program costs and labor requirements. "We were honored to host Norwegian State Secretary Roger Ingebrigsten and members of the Norwegian Ministry of Defence in Palmdale," said Michelle Scarpella, vice president of the F-35 program for Northrop Grumman. "They were able to see firsthand our state-of-the-art production facility and understand how Kongsberg is contributing to our mutual success." In June 2011, the Norwegian parliament approved plans to purchase an initial four F-35s for delivery in 2018. Norway, one of the eight international partners on the F-35 program, has made significant contributions to its design and development. 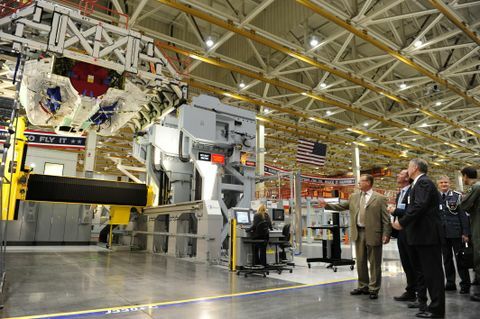 As a principal member of the Lockheed Martin-led F-35 industry team, Northrop Grumman performs a significant share of the work required to develop and produce the aircraft. In addition to producing the F-35 center fuselage, Northrop Grumman also designed and produces the aircraft's radar and other key avionics including electro-optical and communications subsystems; develops mission systems and mission-planning software; leads the team's development of pilot and maintenance training system courseware; and manages the team's use, support and maintenance of low-observable technologies. To date, the company has delivered every center fuselage on time and continues to meet its cost and schedule commitments. In 2011, the company delivered 22 center fuselages and it will make its 100 th delivery in November 2012. Northrop Grumman's Palmdale site is a world-class facility that provides assembly, integration, testing and long-term maintenance capabilities for the F-35, and some of the world's other most advanced aircraft, including the B-2 Spirit and RQ-4 Global Hawk.